Japanese student wearing a black leather jacket, grey silk top, jean shorts, and black heeled boots in Harajuku. Harajuku duo in edgy black floral lace and graphic street styles on the street. Japanese girl street style with leather jacket worn off shoulder, tank top, plaid skirt, fishnets and platform boots. Japanese teens with colorful hair and casual street styles in Harajuku. Harajuku duo with girl wearing an all black fashion style with leather jacket, corduroy dress, fishnet stockings, platform boots, and black backpack; boy wearing a hoodie jacket, checkered pants, sneakers, printed backpack and fuzzy muffler. Harajuku group of girls sporting black streetwear fashion styles while out and about on the street. Harajuku girl group sporting monochrome and all black streetwear including platform boots, sling bags and accessories. Harajuku girl showcasing eclectic street style with bold hues and mixed animal prints. 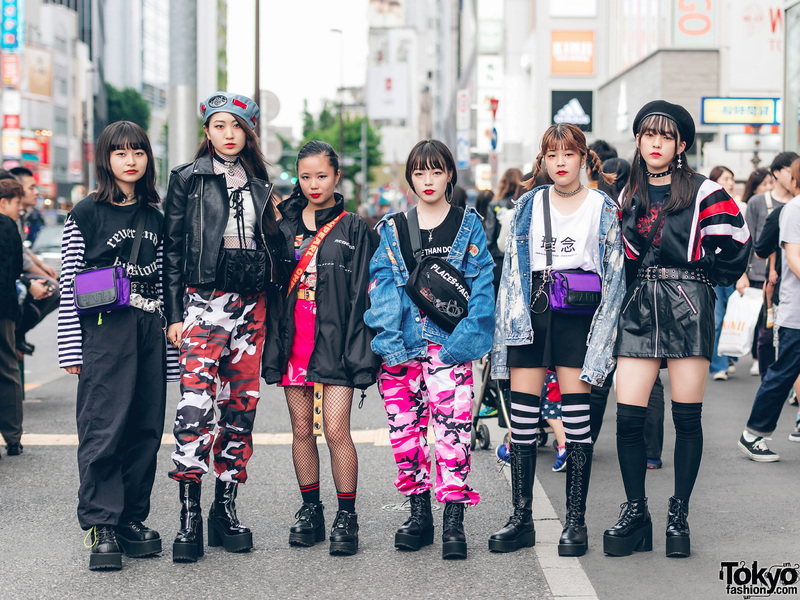 Vintage-loving girls in colorful Tokyo street styles w/ quilted vest over sweatshirt, pink shorts, printed socks & baby doll shoes; printed kimono over knit top, printed skirt, printed socks over fishnet stockings, and denim lace up shoes. Japanese student showcasing all-black winter style with a multicolored scarf in Harajuku.